This soup is my favorite weekly go to, especially as the weather cools down! 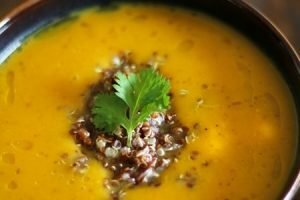 It is full of fiber, rich in plant and animal protein (from the lentils and bone broth), contains a vast array of health enhancing minerals and a ton of flavor. It’s so hearty that just one bowl of it will leave you feeling completely satisfied. The cilantro garnish is great for helping to detox your body from heavy metals and the kraut adds beneficial bacteria to your digestive tract. This soup is particularly good for people who are trying to heal from leaky gut and have trouble absorbing nutrients. Simply sign up below (“subscribe via email”) to receive my once a month newsletter loaded with bonus health tips. Also, be sure to like my page on Facebook and follow me on Instagram @mybalanceandwellness to stay up to date on all the latest food and lifestyle trends. Want to create good eating habits and balance your lifestyle once and for all? Join me for a complimentary consultation to get started! Did you try this recipe? Tell us about it in the comments below!